The West River Homeowners are standing up to New York State. We need your help. Before the Spin Begins . . . .West River Homeowners . . .
have ALWAYS been for the proposed bike path. From the beginning in all of the original discussions, the meetings with the State and the Town and various boards, the people of Grand Island have been for the Path!. From the undisclosed meetings our Supervisor had with the State in January 2016, to the time when he made his media blitz from the helicopter suggesting the road was dead, he has tried to divide this community. In his meetings with the State it was clear there was going to be opposition to closing the Parkway so the spin was to make the West River Homeowners look like they were selfish. Our Supervisor even requested information about the West River Homeowners with docks, from the State. No real consideration was ever given to the thousands of people that were going to be affected or the obvious safety concerns. The required SEQR was NOT done, why not? (New York's State Environmental Quality Review Act (SEQR) requires all state and local government agencies to consider environmental impacts equally with social and economic factors during discretionary decision-making.) The deceptive nature of the relationship between our Supervisor and the State is clearly a cause for concern. The impact from rerouting traffic is definitely within the scope of "enviromental impact". Let's consider the hundreds of homeowners on Staley Road. Unfortunately there is no Staley Road Homeowners Association. Traffic on Staley Road will be drastically affected and their oppions have been muted by our Supervisors media blitz. In addition to the homeowners on Staley Road, the employees of ThermoFisher and Fresenius Kabi many of which, hundreds a day, utilize the West River Parkway to get to and from work. There is a very good possibility they will end up on Staley Road coming from Baseline. The intersections of Baseline and Staley, Alvin and Baseline,the Whitehaven exit of the Thruway are three of the most dangerous and accident prone on Grand Island, add a thousand cars a day? The DOT should be involved in analizing the impact on local traffic and safety, why haven't the appropriate agencies been consulted? In an attempt to collect this information, Mike Madigan, was mocked on facebook. Sometimes people want to ignore the truth and real safety concerns, for some political consideration. Mike's position is purely about safety. If the State had chosen either THEIR Option#1, between the Parkway and the river, or THEIR Options #2 or Option#4 with the path between the Parkway and the Service Road, or propossed Option#5 to share the road, any of which would have been in agreement to the TAP funding and the Greenway Commision directive that it be in a collaberative between the Town and the State. Instead the State chose Option #3 which clearly was in opposition to the Town Board that voted 3 to 2 against and to the peoples responses to the States requests for information, at least 73% of those respondants voiced opositon to closing the Parkway. Any of the States proposed Options other than #3 would be in agreement with the collaberative and give additional access to the river without eliminating a functional road. There is no logical reason why Options 1,2,4, or 5 were dismissed other than saving the State of New York the maintenance costs. For the record the State is not committing to any scheduled maintenance of the new path. Clearly Safety concerns have not been addressed, traffic studies that would included the increased traffic already using Staley Road, including truck traffic. Upkeep of Staley road to handle additional traffic hasn't been addressed, it is time for the people of Grand Island to wake up and take a stand.. . . before it is too late. No one considers the cost of the addtional traffic on alternate Grand Island and Erie County roads, all of which are maintained with our local taxes. One more way the State has dumped it's responsibility on our town. Whether you use the Parkway to get to work, or just for the scenic experience your input matters. The West River Homeowners are standing up for ALL Grand Islanders and they need your help! If you would like to help, with a sign or a contribution to help with the legal expense? You can email RMS@giecom.net and I can help set you up with a sign. Dues are $10 per year or $25 for three years. 1950 - New York State took the land from West River Homeowners by eminent domain. A Scenic Parkway was created and it has been enjoyed by millions of people for over sixty five years. New York State promised the homeowners access to the river in the future. After taking their land, it was the right thing to do. Forty years go by and the State decides it can't maintain the road. Control of the Parkway was turned over to the Department of Transportation, to save money. Maintenance of land and the Parkway became a problem. Snow removal stopped, closing the road for traffic during the winter months, again to save money. Achieving their goal of saving money, but ultimately neglecting their responsibility to maintain the Scenic Parkway they created. In 1990 the West River Homeowners Association adopted the West River Parkway. 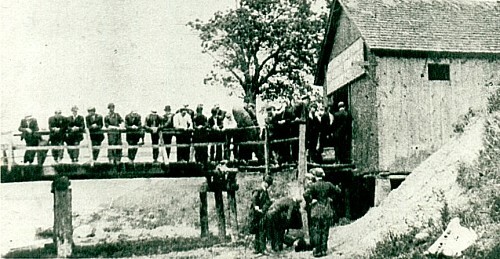 This was the first road in the State of New York to be adopted by a group. For over 25 years the West River homeowners have cut the grass, cleaned up garbage, planted flowers, and enhanced the beauty of the surrounding land. This project was initiated because New York State was neglecting its responsibility. At a workshop meeting of the Town Board on May 2, 2016, the concept of closing the parkway is mentioned by our town supervisor. He received immediate push back from the board respectfully suggesting there would be much concern from the community. On July 20, 2016 New York State Parks held a meeting to present its preferred option for the West River multi-use path. Option #1 between the Parkway and the river, Option# 2 in the median between the Service Road and the Parkway. To the surprise of the majority attending, Option #3, Closing the Parkway, which had never been discussed was the states "preferred" plan. Option #3 was supposedly the cheaper option but it included the addition of 7 parking lots. Later, State Parks removed the seven parking lots, saving even more money but never addressing where people will park if they want to use the proposed path. Immediate backlash resulted from the July 20th meeting which included hundreds of responses to the preferred option by islanders, more than 60% against closing the Parkway. A two week response period for concerns was established by the State. Hundreds of safety concerns from the diverted traffic were submitted. 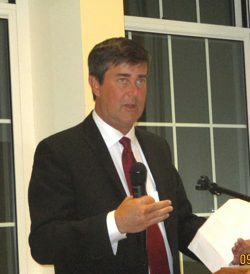 When questioned in early August 2016, Mark Thomas, NYS Director of Parks explained that he believed the Town Board was informed and in favor of the closure of the Parkway. At that point his communication was solely with our Town Supervisor, who admits openly that he knew of the plan in January of 2016. On August 15th the Town Board voted three to two against NY State's Option #3, closing the Parkway, and notified the State. An immediate Social Media Blitz was started by the Town Supervisor that called specific island groups by name, it included personal slurs, photos of West River homes, singling out West River homeowners that were voicing opposition to closing the Parkway, suggesting the WRHOA were against the path. From that point it was not about the multi-use path anymore, it was "For the Path or Against the Path", suggesting the WRHOA were against the Path. Please note, the majority of Grand Island people, the majority of the West River Homeowners and the majority of the Town of Grand Island Council believe the West River Parkway is positive for Grand Island, just the way it is. The majority of Grand Islanders are for a multi-use path along the West side of Grand Island. Interestingly, the West River Service road with wider shoulders is considered by serious bikers to be one of the safest roads on Grand Island. Ironically it is currently marked with signs identifying it as the Greenway Bike Trail. It is very difficult to understand why NY State Parks is pushing so hard to close the Parkway. Concerns over future development of the land have been voiced and supposedly dismissed. There can only be supposition as to how the West River Parkway property could be included in the marketing of State Parks. It is for obvious reasons the West River Homeowners and concerned citizens of Grand Island want real answers as to future use. 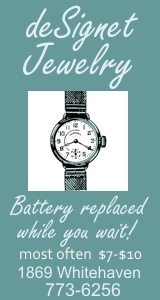 For more information please visit W.R.H.O.A. I'm Frank Greco, president of the WRHOA, which represents about 300 households living next to the West River Parkway. I am here to ask the Greenway Commission as a stakeholder, to revisit the West River Parkway Trail Project. In 2014, the Greenway Commission approved a plan to build a multi-use path between the Parkway and the river. This plan was consistent with the 1998 Town of Grand Island Comprehensive Plan. This original multi-use plan was welcomed by the West River Homeowners Association Board of Directors. In July 2016, the NY State Parks Department informed the public that instead of building a multiuse path, it was choosing to close the scenic West River Parkway and turn it into a multi-use path. This was decided primarily because it was a cheaper option as closing the Parkway only would cost 1.9 million dollars and building a multi-use path would cost 2.9 million dollars. The new plan called for building seven (7) parking lots at all the crossroad entrances, and other amenities required to close the road and move traffic to the adjacent service road. The Parks Department further used the project money to do five other location option studies, traffic studies, and other amenity studies. The WRHOA believes that if you allow the Parks Department to spend Greenway project monies as they wish, the Greenway Commission is going down a slippery slope, where you approve a project to do "A" and construction money is spent to do Project C. This may violate the original TAP Grant proposal. The Town Council of Grand Island recently voted to keep the West River Parkway open to vehicular traffic, and approved a change of plan for the multi-use path to be built in the median near the shoulder of the service road. This is a plan that is welcomed by the WRHOA. Because of this change in the original plan by the New York State Parks Department, we respectfully request the Greenway Commission speak with Mark Thomas from the New York State Parks Department about the changes, and to add this matter to the Greenway Commission agenda for the next meeting in March. The West River Homeowners Assoc. celebrated their 32th anniversary Sunday night, September 25th at the Beaver Island Clubhouse Restaurant with a dinner meeting attended by about 80 members. Mike Madigan was the guest speaker who graciously filled in for NY State Assemblyman John Ceretto who was originally booked as guest speaker, but had an unexpected engagement that he had to attend. Madigan talked about the plan, Option #4, which keeps the Parkway Open and builds a 12' bike/pedestrian pathway on state property at least 10 feet from the West Service Road. It would be built according to DOT standards, which will not require guard rails and will maneuver around trees where practical. He felt this option should be at least cost competitive with option 3, closing the Parkway. He further stated this was the safest option, best for the environment, best for Americans with disabilities and would get the most use based on proximity to the residential neighborhoods, no berms or ditches between local residents and path, unlike option 3. This proposal was approved as the WRHOA preferred option by a 60 to 1 vote. The other important thing to come out of the meeting was the announcement by Madigan of a community meeting on Thursday, October 6th at 7:00 p.m. in the Grand Island High School auditorium to discuss the parkways closure. He indicated that NYS Parks has been invited to the meeting to hear community input. We encourage all to attend. See letter to NYS Parks. Madigan also commented on the current effort to repeal the 2015 local law making tourist homes illegal. After a lengthy discussion the WRHOA members voted 60 to 2 to go on record to keep the 2015 law as is and start enforcing this law immediately. The members also voted 60 to 0 to spend WRHOA money on legal proceedings as necessary to defend keeping the Parkway open. Most felt that getting $2.5 million dollars from a State/Federal grant for the purpose of building a bike trail, then using that money to build 7 parking lots and closing the Parkway to vehicle traffic and calling it a bike path, does not seem legal. Newsletter - Fall 2016. The 32nd annual Membership Dinner & Meeting takes place on Sunday, September 25th at Riverstone Grill at Beaver Island Clubhouse. The West River Homeowners Association (WRHOA) recently held a meeting of all members to discuss the proposed closure of the West River Parkway. The meeting was held Monday evening, August 22nd in the Family Room of Trinity United Methodist Church, Whitehaven Road. Approximately 150 members attended. Board member Michele Ninacs opened the meeting, welcomed members, explained the format for the meeting and introduced President Frank Greco. Greco gave a power point presentation that highlighted the history of the West River, the formation of the West River Homeowners Association, the mission of the organization and major Parkway issues of concern to members of the organization. Following Greco's presentation, the meeting was opened for member comments regarding the pros and cons of closing the West River Parkway. Discussion continued at length with some fifty different members offering opinions. At the conclusion of the discussion, members voted on a motion to keep the West River Parkway open to vehicle traffic. The vote was 127 for keeping the West River Parkway open to vehicle traffic and 4 for closing the Parkway and using it as the proposed bike path. 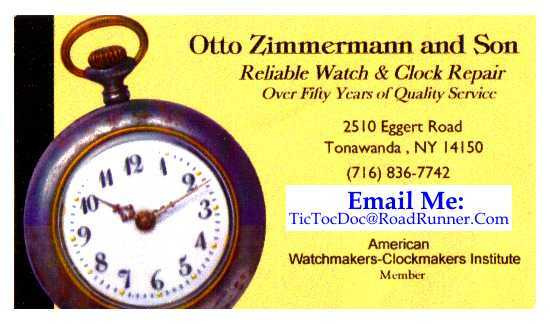 Those who have strong opinions on this matter and would like their voice to be heard should call or write Mark Thomas, NYS District Parks Manager, P.O. Box 1132, Niagara Falls, N.Y. 14303-0132 (Phone: 278-1799) and NYS Assemblyman John D. Ceretto, 800 Main Street, Suite 2C, Niagara Falls, N.Y. 14301 (Phone: 282-6062). Where: Trinity United Methodist Church, Family Room, 2100 Whitehaven Rd. We strongly encourage those living on or adjacent to the West River to attend this meeting. The plan to close the parkway directly impacts quality of life and property values in the West River neighborhoods. We look forward to your input. See you at the meeting! See attached Membership Renewal Notice if you are behind in your dues or have never joined the WRHOA. 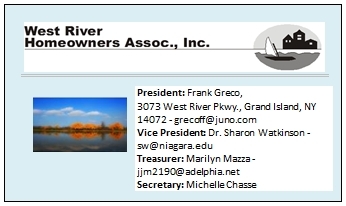 Our WRHOA bylaws say "any property owner or resident residing in the West River area of Grand Island will be eligible to membership in this Association"". So if you have never joined the WRHOA, this is the time to join. Fill out the membership form and mail it in. If you are unable to come to the meeting you can mail the attached form letter to Mark Thomas, District Parks Manager, 1 Prospect Park , Niagara Falls 14303-0132 and John Ceretto, 800 Main St, Niagara Falls 14301. 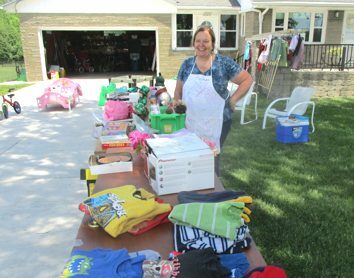 The sun was shining on Saturday June 4th for Jayne Carring as she was one of the ten West River residents who took part in the 5th annual WRHOA garage sale. Approximately over 100 treasure seekers visited the various garage sale participants that weekend! Thank you all for participation! 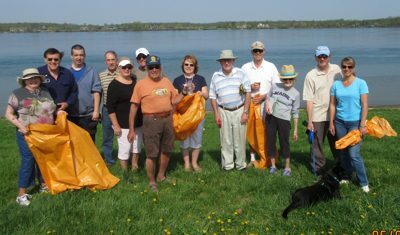 Every year the West River Homeowners Association has a clean-up along West River Parkway in the spring. This year 17 volunteers helped out for the 25th anniversary of the event. See story. Construction of the new bike path to be built between the Parkway road and the river. Scheduled to begin in 2016, it will include brush cutting along the bank. Maintenance of the blacktop (fill pot holes etc.) and grass cutting will be NYSDOT or NYSParks. Beaver Island Park Golf Course improvements. Improving the present DOT policy on Parkway grass cutting. 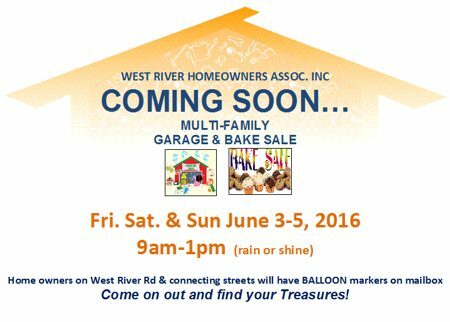 The 4th Annual West River Homeowners Garage Sale - 1625, 1945, 2425, 3073, 3113, 3453, 4025 & others on West River Road - will take place on Friday, July 31st and Saturday, August 1st from 9 AM to 1 PM. 1940's mahogany slant front desk, small oak desk Circa 1900's, mahogany corner shelving unit, depression era oak table, Pig in Poke cookie jar, birds eye maple youth rocker, baby/children's clothes, car seats, toys, washer/dryer, refrigerator, upholstered chair, books, DVDs, tools, household/garden items. 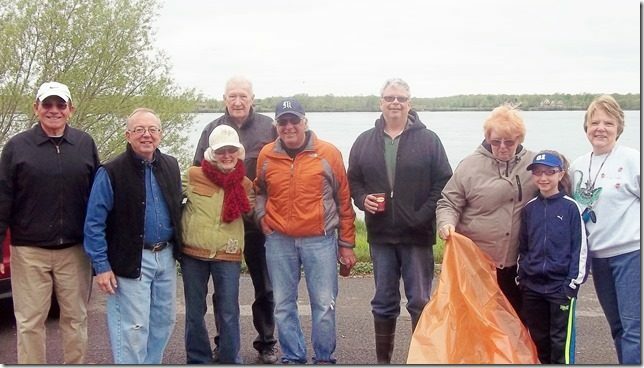 West River Homeowners Association, WRHOA, member volunteers met at the Whitehaven Overlook on Saturday, May 9th to conduct their annual cleanup of the scenic West River Parkway. 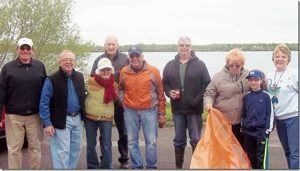 WRHOA was one of the first members of the NY State Adopt-A-Highway Program and have been picking up litter from along the West River Parkway since 1990. The West River Homeowners Association (WRHOA) celebrated its 30th anniversary Sunday, September 28th at Ellden's Restaurant at River Oaks. Town Supervisor Mary Cooke was guest speaker providing the WRHOA members with an update on illegal Tourist Homes located on the West River Road, and the status of the proposed West River Bike Path Project submitted to the Niagara River Greenway Commission. 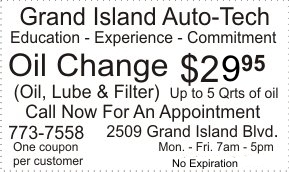 She also gave information on other matters of interest concerning the rest of Grand Island. The WRHOA was presented with a Commendation Citation from the NYS Assembly by Assemblyman John Ceretto, a Certificate of Appreciation from the NYS Senate via Senator Mark Grisanti, and a Congratulatory Certificate from the Town of Grand Island presented by Town Supervisor Mary Cooke. From left to: Jim Mazza, Bob Helenbrook, John Vogel, Carolyn Kreutz, Jake Kreutz ( Adopt a Highway Chairman), Reed Stewart, Marilyn Mazza, Rose Catherine Meaney and Linda Stewart. 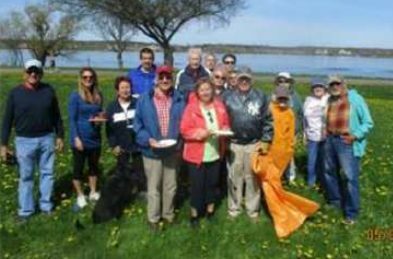 The members of the Association continue to work and honor their commitment, made years ago, to adopt the West River Parkway and keep it clean and beautiful. (left photo ) NYS Senator Mark Grisanti, Supervisor Mary Cooke, Beaver Island State Park Park Manager III Andy Hillman and Town's Historic Preservation Advisory Board member Bill Koch. 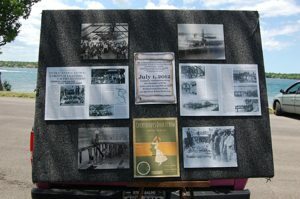 < (right photo) A story board of pictures about the Eagle Park Disaster. 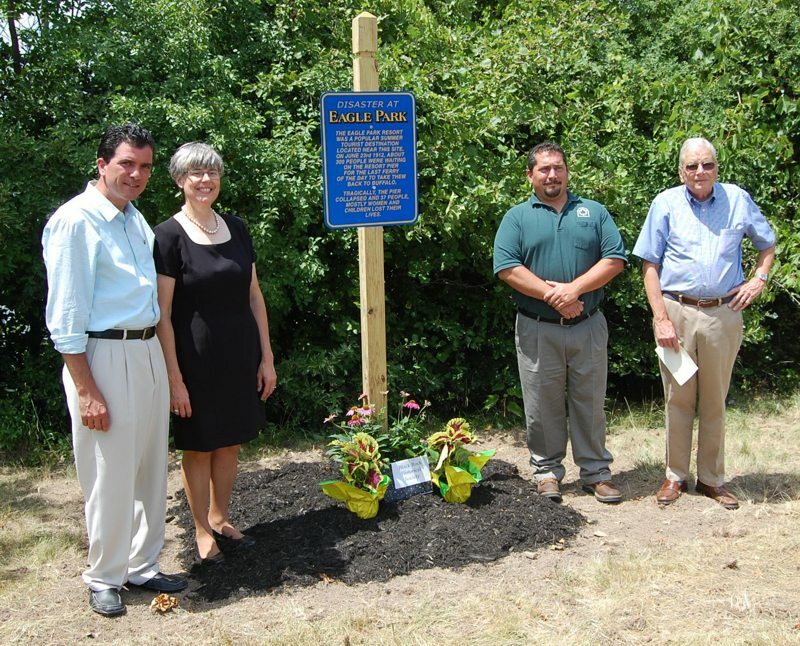 It was a sunny Sunday on July 1, 2012 when people came from on and off the Island to witness the unveiling of a plaque in remembrance of the Eagle Park tragedy that took 39 lives on June 23, 1912. Sponsors for the Memorial Ceremony and Sign Dedication, held at the Whitehaven Overlook, were the Town of Grand Island, Town of Grand Island Historic Preservation Advisory Board, Grand Island Historical Society, New York State Parks Department and the West River Homeowners' Association. Supervisor Mary Cooke welcomed the group of nearly 70 people and set the stage by giving the importance of erecting the plaque at this 100th anniversary. Supervisor Cooke then introduced Rev. Paul Simpson who gave an opening prayer. Members of the Trinity UM Church chorus sang "Grizzly Bear," a song that was popular at the time of the disaster, followed by Grand Island Town Historian Teddy Linenfelser giving a brief history of the tragedy. Others who were introduced were Historical Preservation Advisory Board Chairperson William Koch, NAYS Parks Department Grand Island manager Andrew Hillman, NYS Senator Mark Grisanti, West River Homeowners' Association President Frank Greco. June Crawford, whose idea it was to erect the plaque, was in charge of arrangements. The plaque was unveiled and refreshments were served. 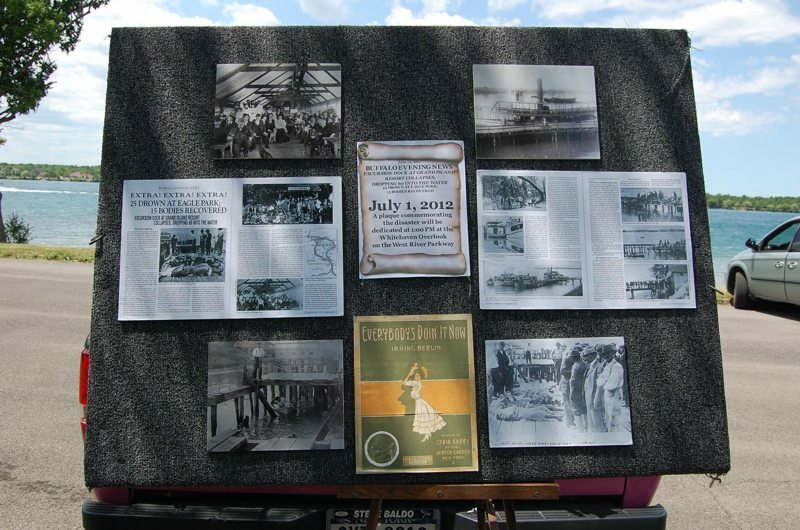 In remembrance of the 39 souls who lost their lives during the June 23, 1912 Eagle Park disaster on West River, Grand Island, NY, a plaque will be dedicated at 1 p.m. Sunday, July 1, 2012 at the south end of the Whitehaven Overlook at 2715 West River Road. 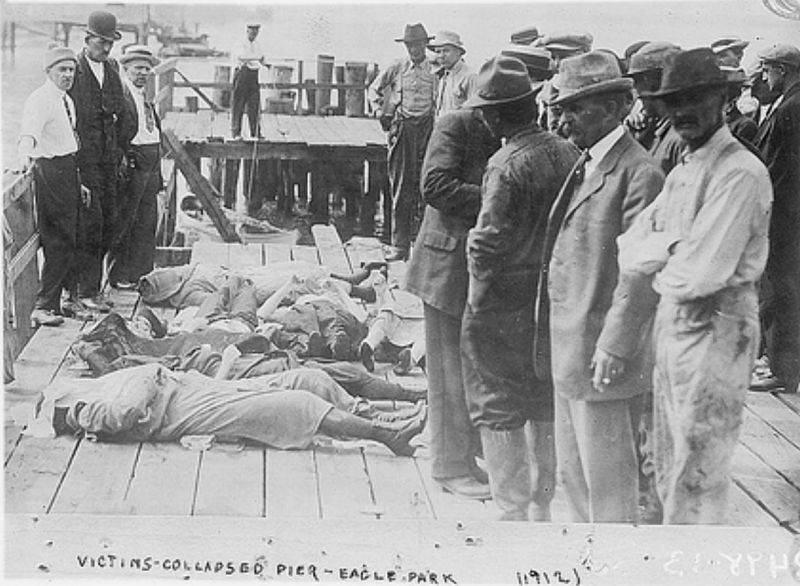 A crowded pier at Eagle Park gave way on that date 100 years ago when about 260 people went into the river, some being trapped under debris. Two hundred and twenty-four were saved. The principal sponsor is the West River Homeowners Association. The public is invited and refreshments will be served. 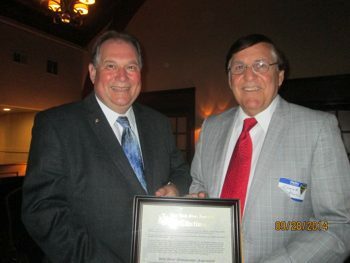 NYS Senator Mark Grisanti was the guest speaker at the West River Homeowners Association's 27th annual meeting held September 25, 2011 at the Buffalo Launch Club. Senator Grisanti indicated that he was going to use his office to get the Department of Transportation to cut the grass on the West River Parkway after residents complained about the 3' weeds/grass growing in the parkway median. "Besides being unsightly, the high grass is creating a problem with mosquitos, mice and vermin," a spokesman for the Homeowners said. 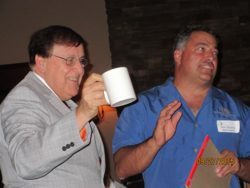 The WRHOA sponsored a Niagara County bus wine tour for this year's summer event. 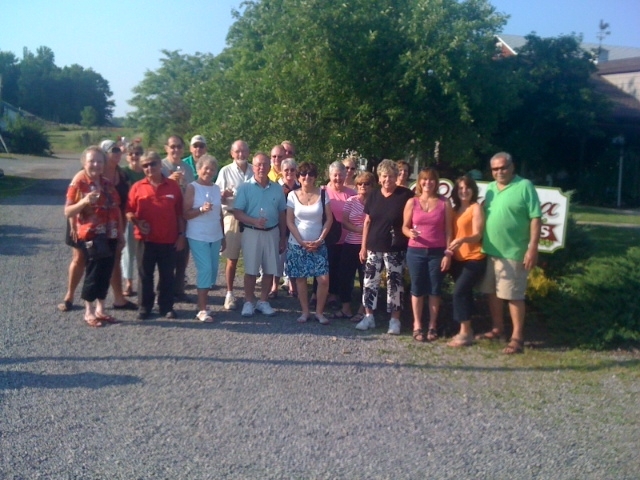 The 25 West River residents visited eight wineries where samples of wine and appetizers were provided. After sampling the various wines, the bus returned everyone safely to their homes. The West River Homeowners assembled on Satuday, May 7, 2011 at the Whitehaven Overlook for their annual "Adopt-A-Highway, Spring Clean Up." The chairman of the cleanup group, Jake Kreutz, was pleased with the large turnout. The homeowners worked dilligently to remove litter and debris that had accumulated over the winter. The West River group continues to be concerned about the beauty of the area and the State's responsibility in cutting the grass and maintaining this scenic parkway. Bob Helenbrook led an informal discussion on the progress he has made regarding this situation. The group is attempting to avoid the problems of last year when grass had reachedd 4' heights.